The Lakefront Series 4-piece bath set in a satin nickel finish is a fantastic addition to any bath. With a transitional styling, this 4-piece bath accessory set brings together modern and classic design. 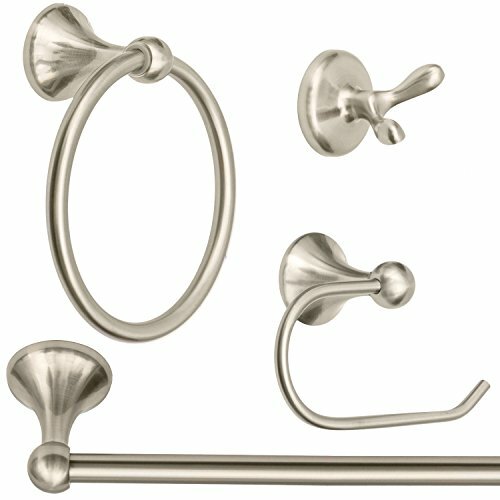 This set includes a 24" towel bar, Euro style toilet paper holder, towel ring, and double robe hook. The 24" towel bar is ideal for hanging wet towels and the Euro style toilet tissue paper holder with a single rod design is perfect for quick and easy roll changing. The towel ring is excellent for displaying decorative towels or for additional hand towels. A double robe hook keeps towels and robes off the floor and out of the way. Features a bracketing system that conceals all screws. Includes mounting hardware and Limited Lifetime Warranty. 4 Piece Set Includes: 24" Towel Bar, Euro Style Toilet Paper Holder, Towel Ring, and Double Robe Hook. If you have any questions about this product by Bennington, contact us by completing and submitting the form below. If you are looking for a specif part number, please include it with your message.